Thankfully, the project I’m working on has multiple environments: production (the most recently-released version), staging (for pre-release testing), dev (for dev team use and testing), and multiple review apps (for feature validation). Additionally, each of the developers on the team will keep the app running locally throughout the day. Suffice it to say, it can be a hassle to keep track of which site we’re using at any given moment. I would prefer to avoid the heart-sinking feeling of looking up at the address bar and realizing that I’ve been ruining the customer’s production data for the last 30 minutes. Thankfully, I haven’t experienced that yet, and I’m doing everything I can to avoid it in the future. What I need is a bright red stop sign warning me away from using the production application unless I absolutely intend to do that. I can customize a page exactly how I want, without interfering with how other users see it. There’s no need to change application code and possibly introduce a bug. I’ve heard of, but never used Greasemonkey, so I was looking for a chance to pick up a new skill. Sharing is slightly more difficult. If someone else wants to use this tool, they need to install Greasemonkey and add this script themselves. If teammates use it and make changes, everyone will need to manually update the script. I wanted to title the page and change the navigation bar to unique colors to make it obvious which environment I’m in. To do this, first install a script manager from your browser’s extension web store. Greasemonkey is only available for Firefox, but other alternatives, such as Tampermonkey or Violentmonkey, may be available for your browser. 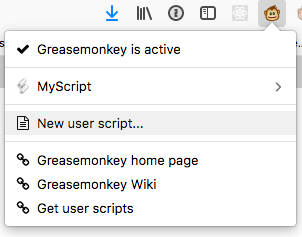 Next, locate the Greasemonkey icon and create a new user script. Getting started was quite simple, thanks to some comprehensive documentation. A Greasemonkey script will begin with a header that specifies some metadata and rules. I decided to pull in jQuery and a function designed for Greasemonkey scripts (waitForKeyElements) that helps with AJAX requests. These are brought in with the @require tag. The @match tag indicates where to run this script. Match pattern syntax can be seen here, and additional configuration metadata options are outlined here. The next step is to put the waitForKeyElements function to good use. This will require that the given element matching the selector is present before you execute the action. If a site does not perform any AJAX requests, this may not be necessary. Because we know the page is loaded, we can find elements, add content, and update styles. However, with just a few tweaks, this can be outfitted to work on the other environments as well. // turns "https://pr-123.herokuapp.com/" into "PR-123"
As you can see, they are clearly very different from the original header. Use separate logins for different environments (e.g. no more ‘admin’ that is available in all environments). Block the website or require a password with a browser extension or desktop application. Change the look of the application based on an environment variable. This would be viable for non-web-based applications, but it requires code changes. Change the terminal prompt, etc. of different machines. My solution was really simple to write, and it took just a short amount of research and experimentation to get it working. Now, when using the application in different environments, it is immediately clear which one I’m using, without looking at the address bar.